So as we approach Himalayan char grill a hop, skip and ‘Bob Beamon’ long jump from that exact hostel, those heady 80’s memories come flooding back. Himalayan char grill hasn’t been on Glebe Point Rd since the prime days of Craig Mclachlan but nonetheless is starting to build its own presence. 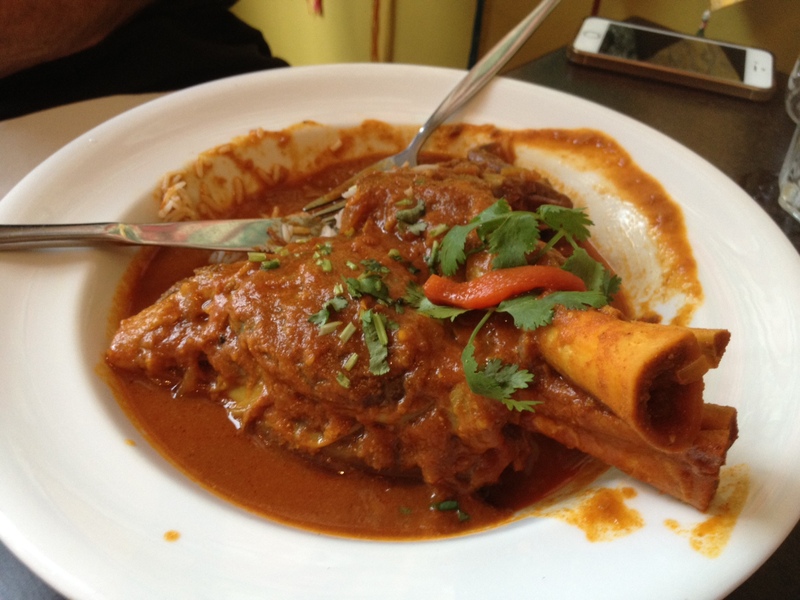 Since appearing in Mosman in 1996 this Nepalese restaurant has branched out into Crows Nest and Glebe in recent years. Tonight on the guest list is Bun and Matty Mac, our good friend and world famous tennis umpire who has a love of food matched by ours. As it’s BYO I’ve brought a big bottle of Stone and Wood Pacific Ale, not sure if it matches with Himalayan cuisine (probably not) but we’ll give it a whirl. For entrees’ we begin with ‘Veggie Momo’, traditional steamed dumplings served with a tomato relish. They are light, tasty and a perfect way to fire up the tasty buds. 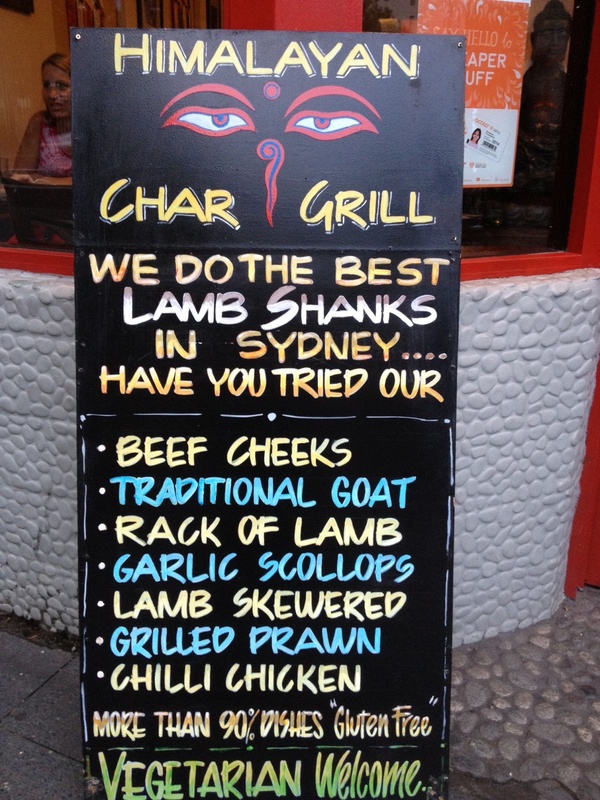 As Matty Mac loves his meat he is intrigued by the Lamb Shanks, especially since the sign out front of the restaurant confidently states “We do the best Lamb Shanks in Sydney”. We also told him on previous visits we witnessed other diners indulge in the shanks and meat was literally collapsing off the bone. As we are creatures of habit Bun and I go for the ‘Aloo Mushroom’ with baby potatoes cooked in a creamy tomato based sauce with green peas and coriander. 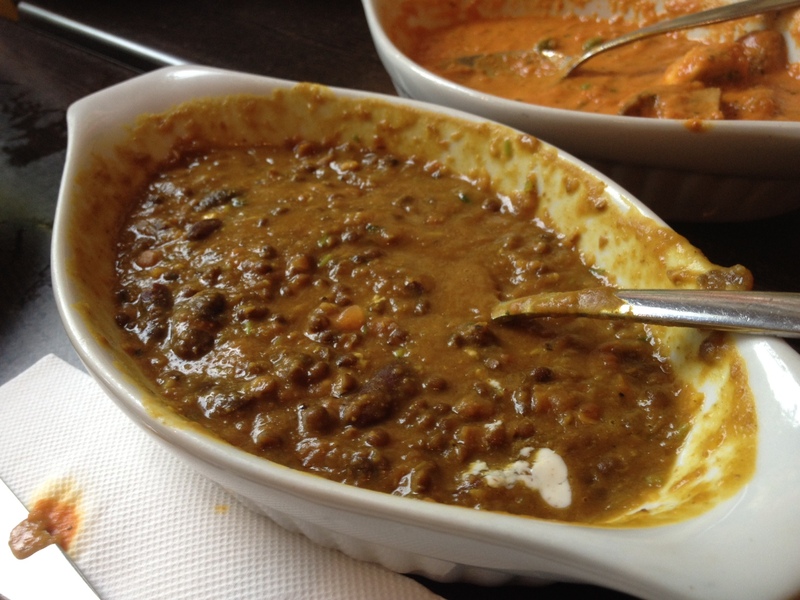 To compliment that we order the ‘Daal’, which is mixed lentils cooked Nepalese style with ginger and mild spices. Naan bread and Basmati rice is a given. This combo, the Aloo Mushroom, Daal, Naan bread and rice is absolutely fantastic. As we mix, match and scoop our way through the dishes the dipping of the Naan bread into the Aloo sauce will be the highlight of the night, it really is a treat. 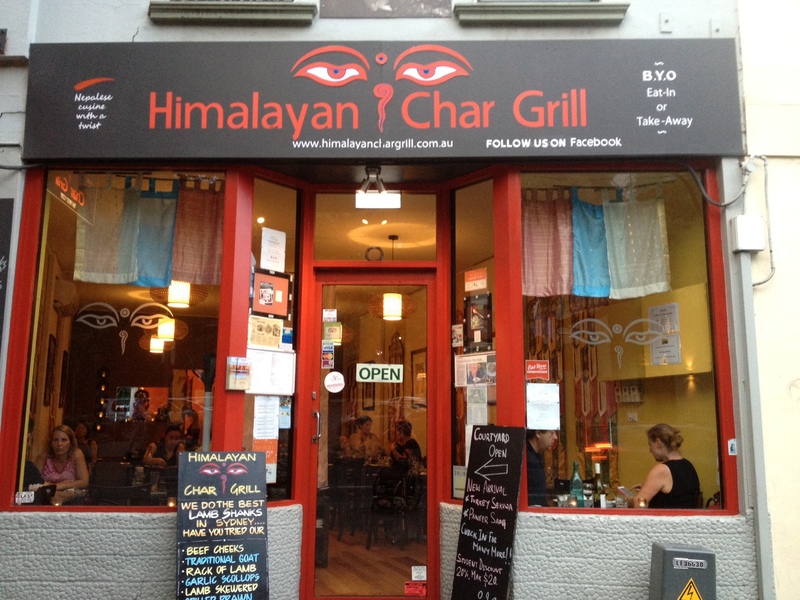 Himalayan Char Grill advertise that they have ‘High altitude food served with great attitude’, I couldn’t agree more, every time we’ve dined here the service has been friendly, attentive and without delay. They seem to have a variety of staff as we’ve never had the same waitress twice; they are obviously well trained and care about your experience. The menu is extensive, ranging from a Fish Curry (Perch fillet cooked in Nepalese style creamy sauce with ginger and mushroom and tempered with roasted nigella seed) to Goat meat (Nepalese favorite dish cooked with chef’s secret recipe) and a range of Chicken, Lamb, Beef and vegetarian dishes. The decision is in on Matty mac’s lamb shanks, which are slowly cooked in bay leaves and cinnamon flavored tomato and caramelized onion based sauce. The shanks “were very good mate, the meat was tender, fell off the bone but the sauce was a bit rich and overpowered the taste of the meat”. As for Bun and I we come here three or four times a year and whilst we haven’t dined at every Glebe Point Road restaurant I feel this little Himalayan grill would be hard to beat. Summary: I forgot to take a photo but order the Aloo Mushroom and dip the Naan bread in, it is good, so very very good. Previous PostCan Peyton Manning beat Father Time?Next PostWho doesn’t love a Muscle Car!